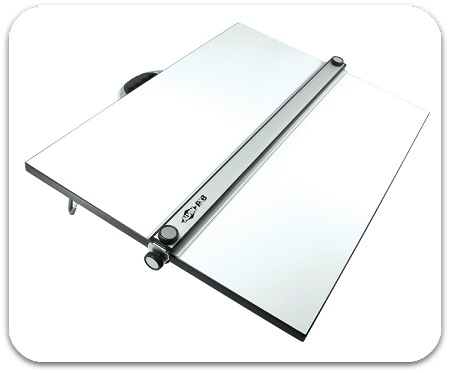 Alvin PXB parallel straightedge boards provide the convenience of a studio work surface in a compact, portable unit. Each PXB drawing board is made from a smooth, warp-free, white Melamine laminated board and is equipped with a convenient carrying handle, non-slip tractor feet designed to grip the table edge at the perfect drawing angle, and an acrylic straightedge whose height can accommodate various material thicknesses beneath. Boards available in 6 widths from 20" to 42"
Shipped fully assembled direct from Alvin & Company. 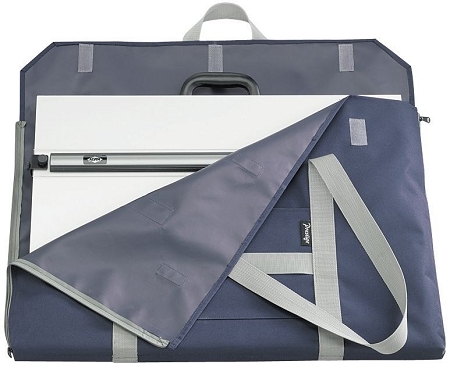 Constructed of durable, lightweight nylon and designed for versatile carrying applications, this portfolio is roomy enough for carrying extra project supplies and pads. Fits Alvin PXB Drawing Boards. Extendable length handles become shoulder straps. Third handle provides extra control when using shoulder straps. Features side zippers and Velcro® fasteners at top for easy access. 7"x9" outside pocket and 1" reinforced gusset. Shipped directly from Alvin & Company.